An English language assessment test can do more than help institutions evaluate students. Colleges, high schools, and English language programs use iTEP to evaluate themselves and improve upon their weaknesses. 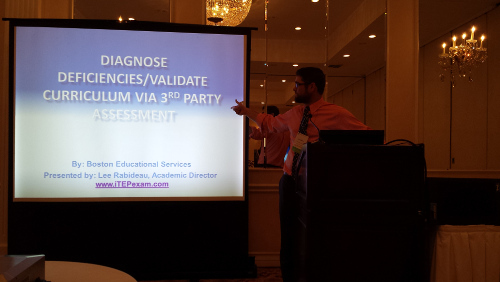 By having a sampling of students take an iTEP exam, institutions can calibrate their placement practices and detect strengths and weaknesses, both in their curriculum, as well as among their teachers. iTEP’s detailed score report, which displays sub-skill scores within each of the test’s sections (reading, listening, grammar, writing, and speaking), enables educators to see how their students compare on specific skills. It can also help measure progress, set expectations, and more. “Many of the teachers and administrators I met at the CATESOL Annual Conference were very excited about the chance to take a step back and look at their methods, teachers,curriculum, and of course, students, through an objective lens,” says Lee, who can be reached at lrabideau@iteponline.com.